The growing sense around the Nuggets is that the team wants to see if Michael Malone can mentor Kenneth Faried the way he reached DeMarcus Cousins with the Kings, and it seems highly unlikely that Denver will trade the power forward before the start of the season, writes Steve Kyler of Basketball Insiders. The Heat want to hold on to Luol Deng and see how well the team can play, sources close to the organization tell Kyler, but if Miami underwhelms, Kyler believes Miami would put Deng on the block. The Raptors are not entertaining trades for DeMar DeRozan, sources close to the team informed Kyler. The additions that the Clippers made this offseason to bolster their bench have made them the NBA’s most improved team heading into the 2015/16 campaign, opines Bradford Doolittle of ESPN.com (Insider subscription required). Doolittle also calls out the Hornets and Mavericks as teams that have made positive strides this Summer, while listing the Nets, Sixers, and Suns as franchises that have taken a step back this offseason. With the NBA’s salary cap expected to increase dramatically next Summer there are a number of pending free agents who stand to benefit from the windfall, Kevin Pelton of ESPN.com (Insider subscription required) writes. Some under-the-radar players who can expect significant pay increases on their next contracts include Michael Kidd-Gilchrist (Hornets), Harrison Barnes (Warriors), Langston Galloway (Knicks), and Jordan Clarkson (Lakers), Pelton opines. Pacers signee Jordan Hill has been arrested after allegedly driving 107 mph near Atlanta, reports Mike Petchenik of WSB-TV (Twitter link). “We have been informed Jordan was arrested for allegedly reckless driving in Atlanta, Georgia. It is obvious we don’t condone this. We will address this with Jordan. This is a major concern of safety, not just for Jordan, but for others,” president of basketball operations Larry Bird said in a statement the team issued via Twitter. Hill is scheduled to make a guaranteed $4MM on his one-year contract this season, according to Eric Pincus of Basketball Insiders. Former Mavericks center Bernard James has signed a deal with the Shanghai Sharks of China, Michael Scotto of SheridanHoops reports (Twitter link). The length and terms of the arrangement are unknown, likewise if the pact contains an NBA out clause. Dallas had renounced its rights to James earlier this week. James re-signed with the Mavs back in March for the remainder of the season after completing two 10-day pacts with the team. He made 16 appearances for Dallas, including two starts, and averaged 2.8 points and 2.4 rebounds in 9.9 minutes per contest. The Pelicans have waived guard Toney Douglas, the team announced. The release of Douglas reduces the Pelicans’ current roster count to 12 players. The player’s 2015/16 salary of $1,185,784 would have become fully guaranteed if he remained on New Orleans’ roster through Saturday, as is shown by our schedule of guarantee dates. Douglas was originally signed by the Pelicans on February 4th, then was released on February 19th before subsequently re-signing with the team for the remainder of the season back on March 24th. Douglas, 29, appeared in 12 games for New Orleans during the 2014/15 season, averaging 4.3 points and 2.0 assists in 14.8 minutes per game. His career numbers through six NBA seasons are 7.6 PPG, 2.2 RPG, and 2.2 APG. The Sixers are looking to move veteran forward Carl Landry, who apparently doesn’t factor into the franchise’s plans for next season, Jake Fischer of SI Now reports (Twitter link). Philadelphia intends to try and trade Landry, and falling short of that, will look to reach a buyout arrangement with the player or waive him outright, Fischer notes. Landry, 31, is set to earn $6.5MM for each of the next two campaigns, and was acquired by the Sixers as part of the trade that garnered the franchise shooting guard Nik Stauskas. The other veteran big man obtained in that deal, Jason Thompson, was dealt today to the Warriors in exchange for Gerald Wallace. 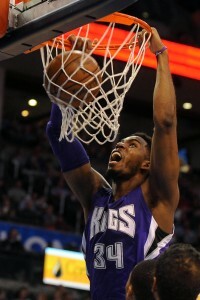 The veteran forward appeared in 70 contests for the Kings during the 2014/15 season, averaging 7.2 points, 3.8 rebounds, and 0.4 assists in 17.0 minutes per game. Landry’s career numbers through eight NBA seasons are 10.9 PPG, 5.0 RPG, and 0.7 APG, and he owns a slash line of .534/.176/.788. 4:36pm: Philadelphia receives the right to swap the lesser of the 2016 first-round picks coming their way from the Heat and the Thunder for Golden State’s 2016 first-round pick, tweets Keith Pompey of the Philadelphia Inquirer. 4:05pm: The Warriors have acquired Jason Thompson from the Sixers in exchange for Gerald Wallace, both teams announced via press release. Cash and draft considerations are also going to Philadelphia in the move. It’s a money-saving deal for Golden State, which sends Wallace’s $10,105,855 salary into Philadelphia’s cap space, with Thompson’s $6,908,685 salary going back in return, and with the Warriors poised to pay the luxury tax this season, the move saves the Warriors from tax penalties of as much as two and a half times the difference between their salaries. It also creates a trade exception worth $3,197,170 for Golden State. Thompson will ostensibly fill the reserve power forward role that David Lee played last year for the champs, who sent Lee to the Celtics in the deal that brought in Wallace. The 29-year-old Thompson has chiefly been a starter during his seven years in the NBA, all of which came with Sacramento before the trade earlier this month that sent him to Philly, but he probably won’t mind a reduced role on a team with a legitimate shot to win another title. Thompson has never appeared in a playoff game. It was somewhat surprising when reports emerged following Golden State’s agreement on the Lee trade that the Warriors intended to keep Wallace rather than release him and use the stretch provision to spread his salary and lower their tax bill. Thus, it makes sense to see them make another deal that sends Wallace away and takes a chunk out of their team salary. The Warriors were scheduled to pay Lee $15,493,680 this coming season, so they’ve reduced their obligation by more than 50% with the pair of trades. The estimated tax bill for the Warriors drops from $24MM to $16MM with today’s trade, according to former Nets executive Bobby Marks (Twitter link). It had been $38.1MM before the Lee trade, Marks adds. Lee signed his deal prior to the adoption of the current collective bargaining agreement, so he’s ineligible for the stretch provision. Thompson’s contract runs through 2016/17 with $2.6MM partially guaranteed on a salary of $7,010,378 that season, Marks points out (Twitter link). That salary becomes fully guaranteed if he doesn’t hit waivers by June 26th, 2016, as Marks also notes. The Sixers receive yet more draft assets and draw closer to the $63MM salary floor. They held more than $20MM in cap flexibility prior to the trade, and they still have about $17.5MM they can spend, not counting their non-guaranteed deals, giving them flexibility to absorb other contracts via trade. They could also float a bloated offer sheet to Norris Cole, in whom they reportedly have interest, or to Tristan Thompson. Philadelphia clears salary from its 2016/17 books, since Wallace is on an expiring contract. Who do you think got the better end of this trade? Leave a comment to weigh in. The Kings have emerged as a possibility for free agent Hedo Turkoglu, sources tell Adrian Wojnarowski of Yahoo! Sports (Twitter link). Friend and former teammate Vlade Divac is in charge of Sacramento’s front office as vice president of basketball and franchise operations. The 36-year-old who spent the past two seasons with the Clippers wouldn’t rule out retirement or playing overseas when he spoke about two months ago, but Wojnarowski indicates that the Jim Tanner client now wants to continue his NBA career. He averaged 3.7 points in 11.4 minutes per game across 64 appearances for the Clippers this past season, but he saw only 5.0 MPG in the playoffs, and it’s unclear if the Clips want the 15-year veteran back. Chatter has been scarce about NBA interest in Turkoglu this summer. Sacramento has 14 fully guaranteed contracts, plus David Stockton on a non-guaranteed deal. The Kings preserved a measure of flexibility when they waived Eric Moreland earlier this week, in advance of Saturday, when his contract was to become fully guaranteed. 2:55pm: Tokoto has made it clear he has no intention of signing overseas or in the D-League, Charania writes in a full story, a further break with previous reports. 1:13pm: The Sixers and No. 58 overall pick J.P. Tokoto are negotiating toward a deal that would bring him to training camp, and the shooting guard from North Carolina plans to sign with Philadelphia, a league source tells Shams Charania of RealGM (Twitter link). That’s a surprising development, since all indications had been that he would sign overseas or in the D-League. Tokoto let the Sixers know he was open to becoming a draft-and-stash pick before Philadelphia selected him, as Jake Fischer of SI Now reported shortly after the draft, though it seemed he would have a chance to earn his way to a roster spot with a strong showing in summer league. The former North Carolina mainstay wasn’t particularly impressive this month, missing all 10 of his three-point attempts and averaging just 5.7 points in 23.1 minutes per game across seven appearances with Philadelphia’s summer league squad. Still, he never averaged double-figure points in college, relying instead on elite defense, as Chad Ford’s ESPN Insider profile suggests. Ford ranked him the 52nd-best prospect in the draft, while Jonathan Givony of DraftExpress had him even higher, at No. 46. Standing 6’6″, Tokoto rebounds well, having pulled down 5.6 boards in 28.9 minutes per game for the Tar Heels this past season. Philadelphia only has 12 fully guaranteed salaries for the coming season, counting the freshly signed Richaun Holmes, the team’s other second-round pick this year. The Sixers have contracts or reported deals with five others that include no more than partially guaranteed money, so the addition of Tokoto would give the team 18 players, two shy of the offseason roster limit. Do you think the Sixers should have Tokoto on the roster this year, or wait until next season? Leave a comment to let us know. The Nuggets are expected to retain Erick Green through Saturday, when his non-guaranteed $845,059 one-year veteran’s minimum salary is scheduled to become partially guaranteed for $100K if he doesn’t hit waivers, reports Christopher Dempsey of The Denver Post (Twitter link). The 46th overall pick from two years ago projects as the third-string point guard behind rookie Emmanuel Mudiay and Jameer Nelson. Green signed a three-year deal for the minimum last summer after he spent a year as a draft-and-stash prospect with Italy’s Montepaschi Siena. The former ACC Player of the Year from his time at Virginia Tech carved out only a limited role on the Nuggets as a rookie, averaging 3.4 points and less than an assist in 9.5 minutes per game. The now 24-year-old also spent a brief time on D-League assignment. Denver is also expected to re-sign Darrell Arthur, as Dempsey reported earlier, and assuming his salary will be fully guaranteed, the Nuggets are poised to have 15 fully guaranteed salaries, the regular season roster limit. That means one of them will have to go for Green to stick into the regular season, and it seemingly makes chances remote that the Nuggets keep Kostas Papanikolaou past October 4th, when his $4.797MM non-guaranteed salary would become guaranteed.